A quick idea for a telekinetic attack. Face the enemy (or enemies) you want to attack, hold left click ('X' on keyboard) to lift the enemies into the air, then right click (or 'Z') to launch the enemies in the direction they're facing. It'll make more sense when you try it out. The setup is quite simple. At its most basic, I'm emitting an invisible 'Pusher' monster behind every lifted enemy when you right click. The Pusher is offset behind the enemy (-Y) with a positive velocity (+Y). When it launches, it pushes the monster toward whichever direction it's facing . . . In this case, that's conveniently toward some lava. Feel free to use this in your level. Comment with suggestions or fixes or ideas. It's a bit too heavy for the browser, so try it out in the app. An attempt to create sentries that only chase you while you're in their line of sight, but not through walls or objects. While the player is within the sentries' angle of vision ( as indicated by the color-changing tiles), they shoot out invisible collectibles that auto wield, auto shoot, then dewield. While the player is wielding the item, the sentries switch to Chase mode. After 3 seconds, the item uses all its ammo and dewields, switching the sentries back to Watching mode until the ammo is filled up again. One problem is that it takes time for the collectibles to reach the player, so there is lag between the sentries seeing you and the sentries switching to Chase mode. The spread of the collectibles is also unreliable and they tend to clump when being shot at 45 degree angles, often missing the player. There are also some performance issues with firing so many collectibles. If there is a better way to achieve or optimize this, let me know! Maybe this will eventually be VR Training. We'll see! So, Zep (or anybody who has some tips)! I'd like to start composing my own chiptunes. At this point I'm fairly comfortable with MilkyTracker from tutorials and covering songs, and I'm familiar with basic music theory from playing piano, but I still run into a brick wall of uncertainty when trying to compose anything original. I was wondering where you start when composing your tunes. How do you choose what instruments you want to use and what you want them to sound like? How much does knowledge of music theory affect your composition decisions? Do you use samples from other sources in your chiptunes, or do you create all your own instruments? As it is now, it feels a little like I'm trying to make a sculpture by shouting hexadecimal values at a ball of clay. How do I set up the diagonal frame for quantization (8)? I'm really excited to see what sort of 8 directional things I can make! Also, I noticed an Inv. Item trigger. Is this trigger (which makes it sound like there's a way to make a player inventory) a fully implemented feature? through numerous islands to find the source of the tsunami that destroyed your village. Planned features include lots of adorable character animations, a wave generator, and a rudimentary sea map! I'll work hard to make an excellent game. P.S. 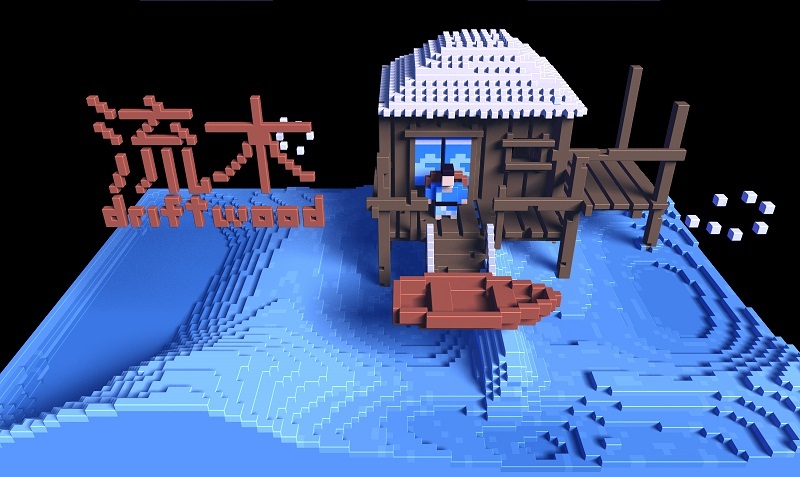 Can someone confirm that the Kanji say "driftwood"? A little more forum spam for today! But it's a fun one. Made a neat little poster promoting Metal Gear Voxel using POV-Ray to render. You guys should create some for your levels, too! Credit to Konami for the character and typeface, of course. After many, many hours of work.... It's a few minutes long. 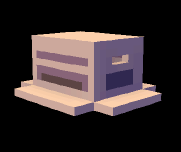 The first stable landmark release of my Metal Gear tribute, Metal Gear Voxel. 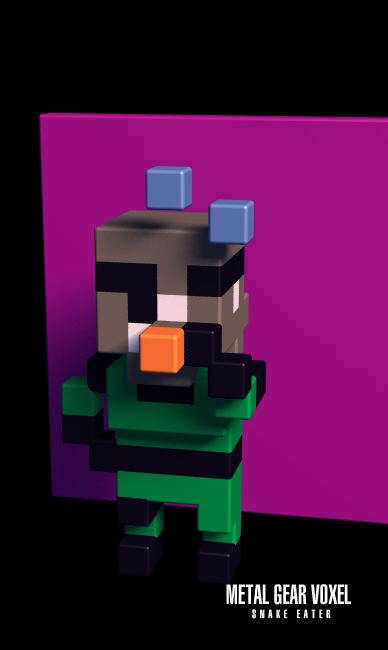 Inspired heavily by Metal Gear Solid 3, I've done my best to "voxelize" the graphics, style, and gameplay of Metal Gear Solid in Voxatron to create a fun fusion of the two games. At this point, I've completed work on the Virtuous Mission portion, which I believe is a good point to rest, pause, and get some user feedback on the level so far. I highly appreciate any feedback you have to give! Be sure to check out new updates!